Size of Male: 11-12 lbs., 9-10 in. Size of Female: 11-12 lbs., 9-10 in. The Norfolk Terrier is known as the smallest working terrier. They are energetic, active little dogs and very adaptable to different situations. They make excellent family dogs and they are happy living in an apartment or in the country. These dogs are affectionate and loyal and love spending time with their family They are hardy, courageous dogs and considered easy to train. They love children and usually get along well with other pets. The Norfolk Terrier was developed in East Anglia, or the eastern coast of England during the 1880s. 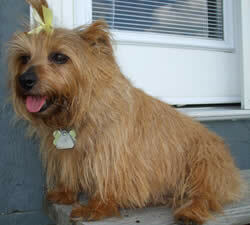 At one time the Norfolk and the Norwich Terrier were the same breed. One of the defining differences between the two breeds is the ear – the Norfolk’s ear folds down while the Norwich’s ear stands erect. The breeds were separated in England in 1964 and in the U.S. in 1979. These dogs originated as barnyard ratters and were also used to “bolt” foxes which had gone to ground during hunts. Since the dogs were small they could easily fit into a fox’s hole and rustle out the fox. After the fox was flushed from his hiding place the hunt could resume. The Norfolk Terrier is a terrier and they are happy, spirited and self-confident. However, they are said to have a softer temperament than some members of the terrier family. In their work they were kept in packs and they get along very well with other dogs. These dogs are very focused on their family and they love children They also typically get along well with other pets, especially if they are introduced to them at a young age The Norfolk makes a very good family pet. Unlike some terriers, they are not particularly prone to digging, though they will dig if they get bored. They can be barkers. Living Environment – This small dog breed strongly desires human companionship and they should not be left outdoors. They can adapt very well to living in an apartment, especially if they get regular daily exercise. Grooming – The Norfolk does require regular grooming and stripping. They have a wire coat that needs to be stripped periodically to keep it looking nice. You can learn to do this stripping yourself or you can take your dog to a groomer. Clipping a Norfolk is said to ruin the coat. Diet & Exercise – Dietary needs are considered normal and they do require regular daily exercise. This dog breed is moderately active indoors and will likely want to see whatever you are doing. They do enjoy having a yard if you live in the country. Health – The Norfolk is generally long-lived and some have been reported to live as long as 19 years. However, they can be prone to mitral valve disease, luxating patellas (slipped kneecaps), and canine hip dysplasia. If you are interested in this dog breed you should talk to a breeder about possible dog health problems. The breed is intelligent and you should be able to teach your dog basic dog obedience skills and good manners. This is a happy, affectionate dog who loves to spend time with his owner. Keep training positive using positive dog training methods (praise, rewards) and you should be able to train your dog without any problem.